Can Muslims voters swing electoral fortunes of candidates in western UP? 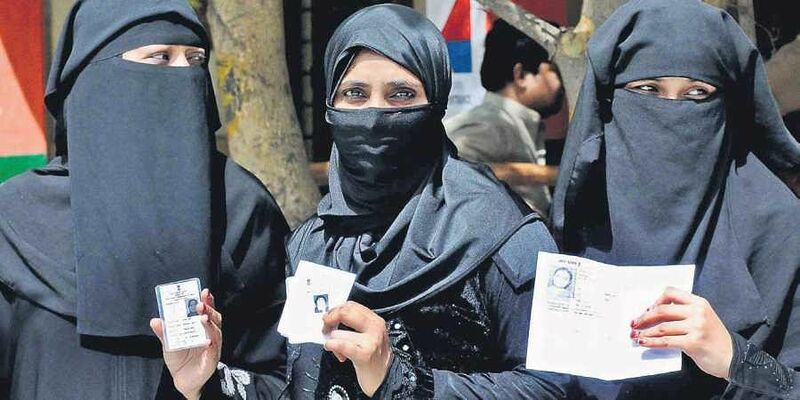 As UP heads into the first phase of the Lok Sabha elections, the large population of Muslims in its western belt is an indecisive lot, torn between the traditional pattern and an eye on the future. Shaukat Ali in Muzaffarnagar is determined to vote for the Opposition grand alliance in Lok Sabha polls. He reasoned that the Muslims must support the coming together of Opposition parties to recover decisiveness of their over two decades of tactical voting to tilt the scale in the Hindi heartland. Ali, 35, is a marginal farmer in Sisouli village of Muzaffarnagar. He seemingly has an easy choice since the grand alliance nominee and Rashtriya Lok Dal (RLD) supremo Ajit Singh is almost in a direct contest with the incumbent MP and BJP’s Jat face Sanjeev Balyan. Mohammed Imran, 25, in Behat in Saharanpur is, however, confused. He’s in a quandary as he’s keen to vote out the incumbent BJP MP Raghav Lakhanpal Sharma, but is being challenged by BSP candidate Haji Fazlur Rehman, an industrialist, and local strongman Imran Masood of the Congress. “Muslims cannot be voting en block. Political prudence calls for Muslims backing BSP, but Masood is too strong a candidate to be ignored. During the Narendra Modi wave in 2014, Masood had polled over four lakh votes here, while Rehman is largely a political novice,” said Imran, who is currently unemployed. The saffron tide in Uttar Pradesh in 2014 had seemingly blunted the sharpness of tactical voting by Muslims, with not a single candidate from the minority community winning elections. Indeed, the 2014 Lok Sabha elections took place under the heavy shadow of Muzaffarnagar communal riots fuelled by Jat-Muslim strife. That episode is now well in the realm of the past, with relative peace prevailing in the western parts of the state.“All 36 biradaree (communities) live in peace. There’s no rift anymore. Muslim labourers are back working on farm fields of Jats and Thakurs,” noted Choudhary Pradeep Singh, a farmer in Baghpat. Incidentally, BJP’s Muzaffarnagar nominee Sanjeev Balyan is not hesitating to seek Muslim votes too. “There’s peace in my district. I, too, have contributed positively in restoring law and order in the constituency. Besides, I’ve worked for all without making any discrimination. So, I am asking for Muslims to support me in the elections,” Balyan told this newspaper. Jameer Shah, 40, in Moradabad, however, thinks otherwise, as he claimed that there’s a sense of insecurity among the Muslims. “My relatives are afraid to travel. They fear that their beards may invite trouble,” reasoned Shah, who is also a farmer.His concerns find echo among Muslims, mulling which way to vote in the polls. “Prime Minister Narendra Modi hasn’t done anything against Muslims. But the BJP leaders keep teasing us with threats to send us to Pakistan,” lamented Naushad Ali in Bijnor. The task for Muslims to make a dent in the saffron bastion appears to have been made difficult by the Congress. With the constituents of the grand alliance leaving out Congress, well-entrenched Muslim politicians have found space in the grand old party to remain politically relevant. In the 16 Lok Sabha seats heading for polls in the first two phases on April 11 and 18, the Congress is being accused of queering the pitch for revival of tactical voting prowess of the minority community. By fielding Muslim candidates in Saharanpur (Imran Masood), Bijnor (Naseemuddin Siddiqui, who had for long been Muslim face of the BSP) and Moradabad (Imran Pratapgarhi), the Congress threatens to throw the calculations of SP-BSP-RLD in disarray. Besides, the Congress has fielded four Muslim candidates in other parts of UP, which include Badayun (Salim Sherwani, former MP), Sant Kabir Nagar (Parvez Khan), Sitapur (Kaiser Jahan) and Kheri (Zafar Ali Naqvi). The firepower of tactical Muslim voting had seemingly been based on political flexibility of the community to align with Hindu caste groups to throw winning social engineering. For Congress’ hey days and the 2009 Lok Sabha elections, the formula was weaving the combination of Brahmin-Dalit-Muslim. With the onset of the BJP on the back of Ram temple agitation led by party’s then-president L K Advani, SP leader Mulayam Singh Yadav emerged messiah of the minority community on the strength of Yadavs and Other Backward Castes (OBCs). In 2007, lawyer-turned-politician Satish Chandra Mishra engineered a tectonic shift in favour of the BSP, giving Mayawati a full majority in the state Assembly by steering Brahmins towards Yadav and some chunk of Muslims. Political observers note that Muslims alone aren’t that lethal vote base to swing the electoral fortunes of political outfits. The Muslims have to rally behind a section of Hindu castes, the political commentators concur. Incidentally, successful social engineering on parts of the Congress, SP and BSP territories created a large pool of Muslim leaders in all parts of the Hindi heartland. They became entrenched in their respective regions to the extent that they feared marginalisation if they stayed away too long from electoral politics. The Congress’ Badayun candidate Salim Sherwani, for instance, represented the Constituency in Lok Sabha for SP in 2004. He drifted from the SP after Dharmendra Yadav, nephew of the SP patriarch, shifted his constituency from Sambhal to Badayun in 2009. Scores of Muslim leaders who couldn’t find space in SP, BSP and Congress have found another alternative platform in Pragatisheel Samajwadi Party of Shivpal Singh Yadav, who launched the new outfit after parting ways with the SP chief Akhilesh Yadav. The BJP’s emergence in the state on the back of party’s mascot (Modi) seemingly cut down the social bases of SP, BSP and Congress to reap political dividends out of Muslim votes. Expanding beyond upper castes and Vaishya (traders) vote base, the BJP’s Ram temple movement attracted a large pool of party workers from backward castes and Dalits. Former UP chief minister Kalyan Singh, Lodh (OBC), helped the saffron outfit make deep inroads in non-Yadav backward castes. In 2014, a Modi-powered BJP penetrated into BSP’s core Dalit vote base as well. Now, the BJP, on the back of major targeted welfarism, appears to have given a template to count on the support of Dalits. “Modi’s singular focus on Swachh Bharat and construction of toilets in rural areas has benefited Dalits. We’ve also gained from other schemes, which were not in sight earlier,” noted Suresha Devi, a Dalit, 35, in Sadadnagar village in Nagina Parliamentary constituency. Unlike Baghpat and Muzaffarnagar where BJP candidates — Satyapal Singh and Balyan — are sweating out in the face of direct contests, giving Muslim voters clarity in their choices, the minority community is seemingly in the same spot as they had been in 2014 when they couldn’t vote en block for one political formation. Despite commanding almost 18 per cent vote share across the constituencies going to polls in the first two phases, including over six lakh votes in Saharanpur and Bijnore (about 35 per cent of total vote base), the prowess of tactical voting seen with lethal effect in the past is seemingly struggling to come back with full might in the current Lok Sabha elections.